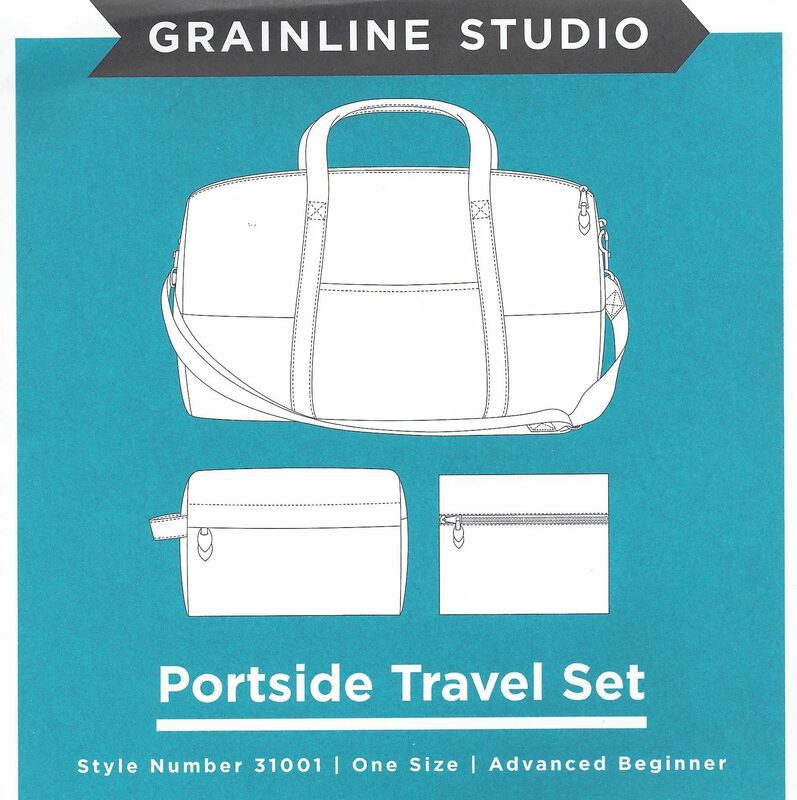 During my return to bag making this year there is one pattern that kept peaking my interest—Grainline Studio’s Portside Travel Set. After seeing so many amazing versions pop up on my Instagram feed and taking a deep dive into #portsidetravelset for even more inspiration, I knew this pattern had to be on my must sew list. I always love the idea of matchings bags and pouches for traveling but I just haven’t taken the time to make it happen! 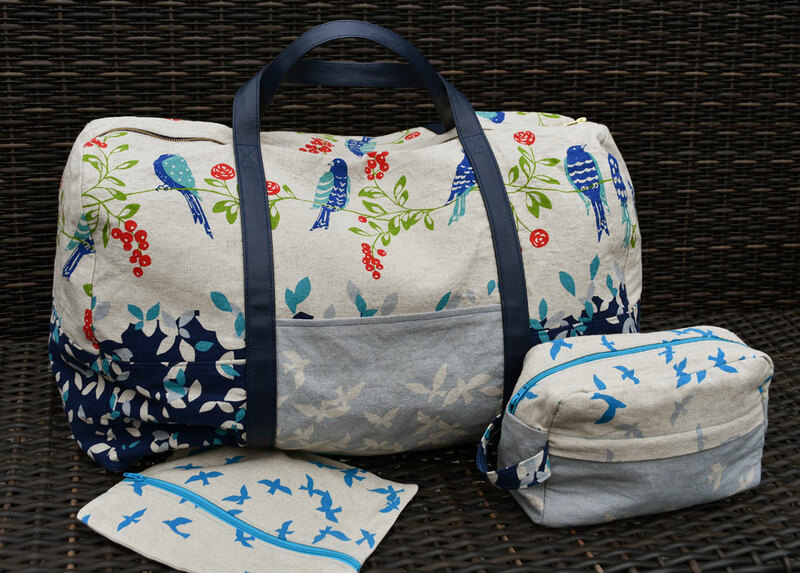 Going with the theme of matching a matching travel set, I wondered if I could make all three pieces out of the same fabric while also making each piece slightly different. After looking at quite a few different options I settled on a gorgeous linen/cotton canvas border print from Japan. I am a sucker for these unique Japanese prints and the Portside set will be a great way to really show it off! I love how as you move across the width of the fabric it almost acts like four different prints, making it a great choice to really experiment with the fabric placement. Armed with 2 yards of the border print and a matching lawn for the lining I set out on the ultimate cutting challenge. I decided to prioritize the pieces of the set, making the duffle the focus and first to be cut out—after all it is the star of the show! I also read through the instructions to see how the pieces went together to see how that might influence my cutting. With all that in mind I started laying out pieces. 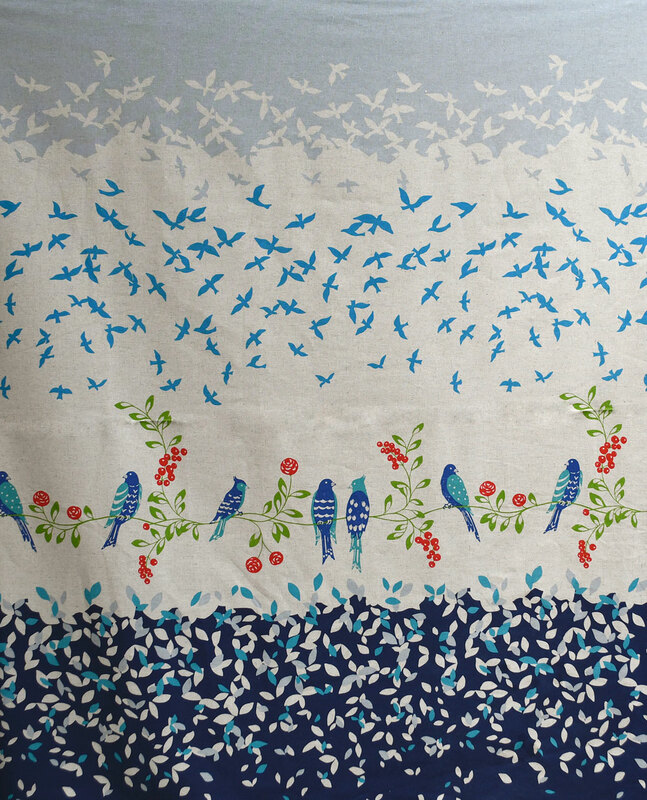 My favorite parts of this fabric are 1) the birds (of course!) and 2) the layered leaves at the very bottom. 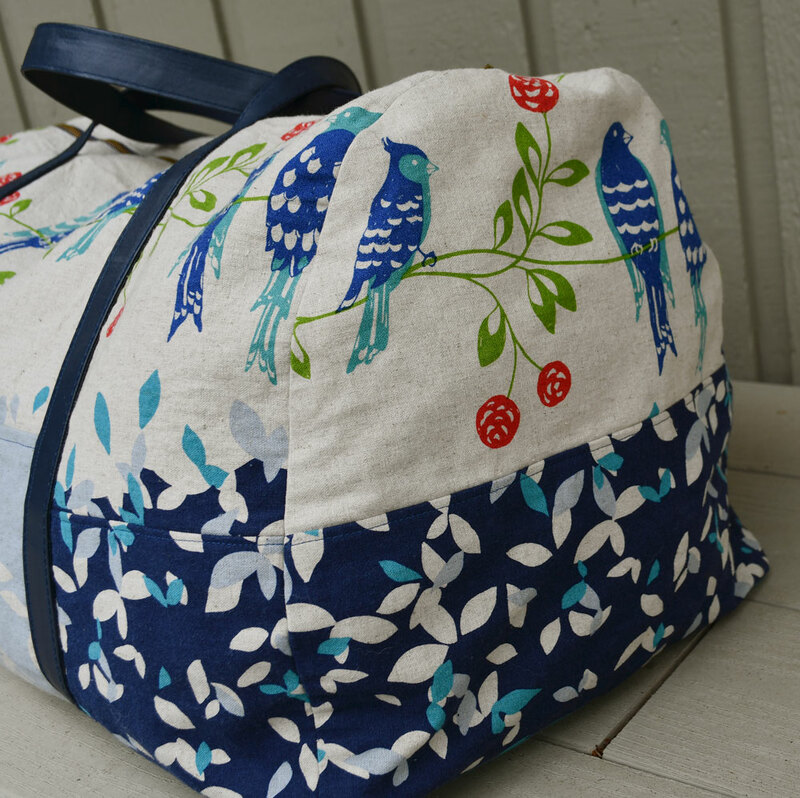 To keep the integrity of these two prints I decided to have the bird branch run all the way around the duffle bag along the top portion. Then, for the bottom half, I used more of the layered leaves making both sides almost look like border print was uncut. The end pieces proved to be the most difficult. I decided to make sure the bottom portion kept with the leaf pattern on the sides so that they matched at the seams. For the top part I discovered if I matched the line of the branch the birds would be cut in half along the top curve. I settled on moving them down a bit so that I maximized the visibility of the birds. Yes, the branch is off by a couple of inches at the seam but I think it maintained the overall aesthetic and look that I was going for. To add even a bit more interest, I broke up some of the leaves on either side with a contrasting pocket cut from the grey birds at the very top of the border. I also realized pretty quickly that I wouldn’t have enough fabric to cut out the giant bottom piece for the duffle. Rather than fuss over this and waste more of the gorgeous Japanese fabric, I settled on using a coordinating solid twill—a fair compromise. Once all of the main pieces of the duffle were cut out I moved onto the Dopp kit (aka ditty bag or toiletry bag). With most of the bird and leaf hpritnes used up, I decided to make this a bit more subtle and used the top portion of the border print. Again, I split the designs so that one became the top portion and the other the bottom, just like the fabric. To add a bit of interest I cut the handle out of a scrap of the colorful leaves and added some bright turquoise zippers from my stash. Fun, right?! 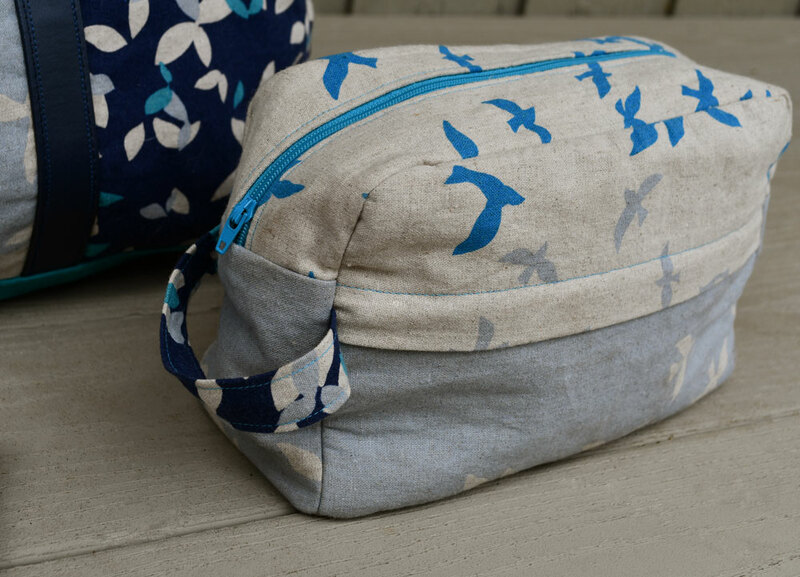 Last but not least, the travel pouch was cut from the same turquoise birds as the top of the Dopp kit. Along with a matching zipper and I was all set! By the time I got everything cut out, there was barely any of the 2 yards left. While cutting did get a bit creative at times, I managed to get everything cut out featuring and matching the prints that I wanted to. Now to get sewing! Construction was straight forward for the most part. Grainline’s instructions were clear although I will say they are more garment sewers than bag makers. The finish is beautiful but there is quite a bit of hand sewing to attaching the lining that did take a full evening in front of the TV. 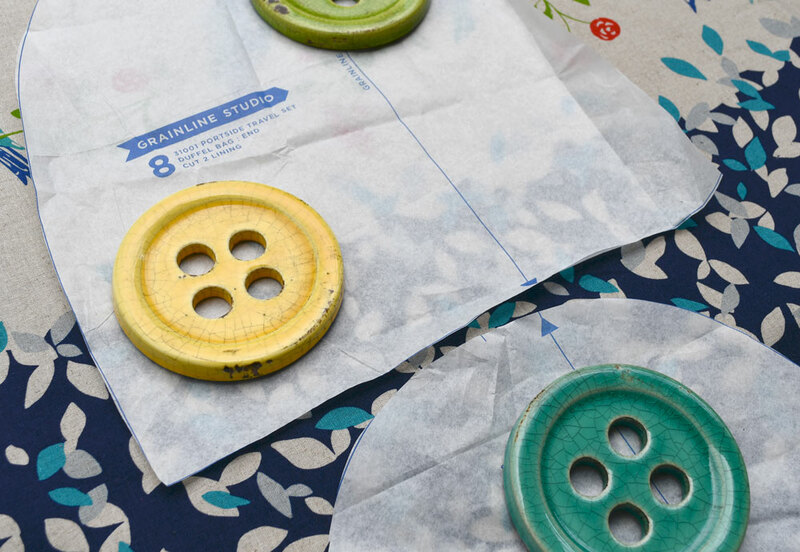 After sewing a few different Noodlehead patterns where the construction is almost magical, I could envision applying some of Anna’s techniques to the Portside pieces, eliminating much of the hand sewing and making life a bit easier! For the handles and straps, I did elect to skip the shoulder strap completely. That just isn’t something that I use on another duffle bag I own so I didn’t even bother here. 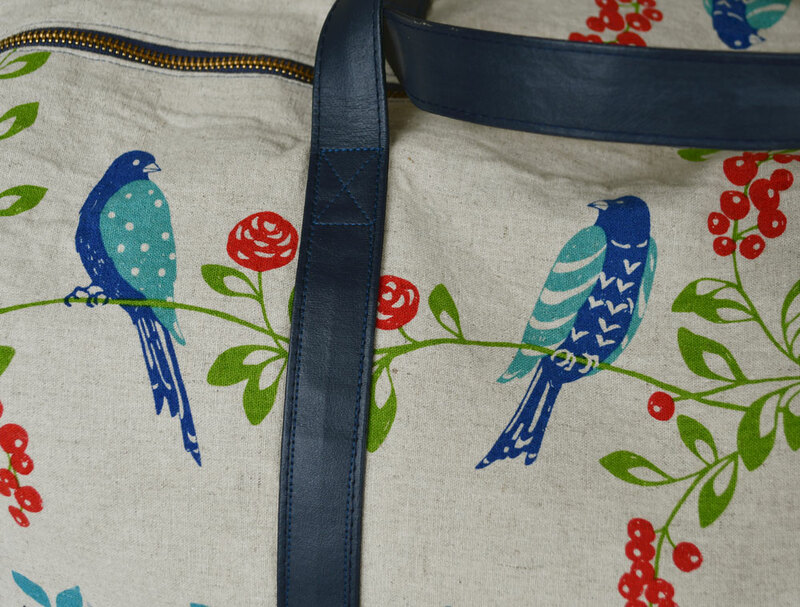 Plus, the hardware and straps would have covered up some of the cute birds on both ends! I also saved some time by using pre-made faux leather strapping for the handles. I like the contrast in texture and the dark navy doesn’t distract from the rest of the bag. 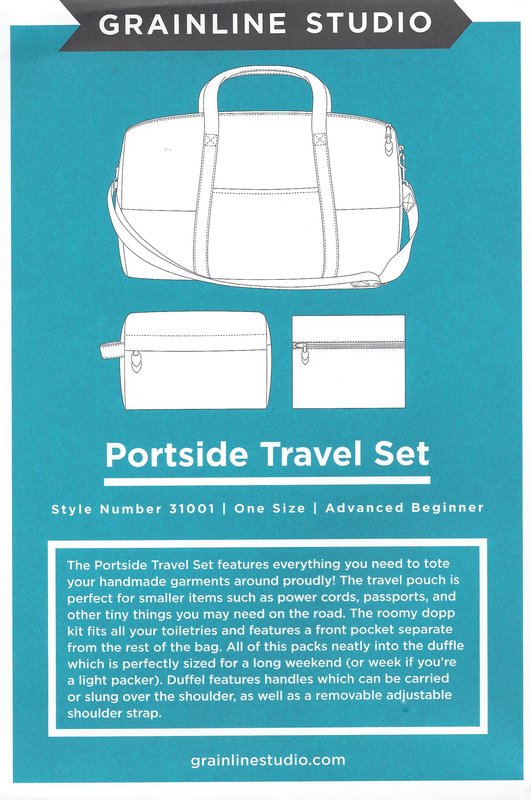 Even with the extra work to attach the linings by hand, I love how my Portside Travel Set turned out! They match but each one is also unique which makes this set even more special. The only change I might make for future version would be to use a heavier interfacing or additional layer of interfacing. 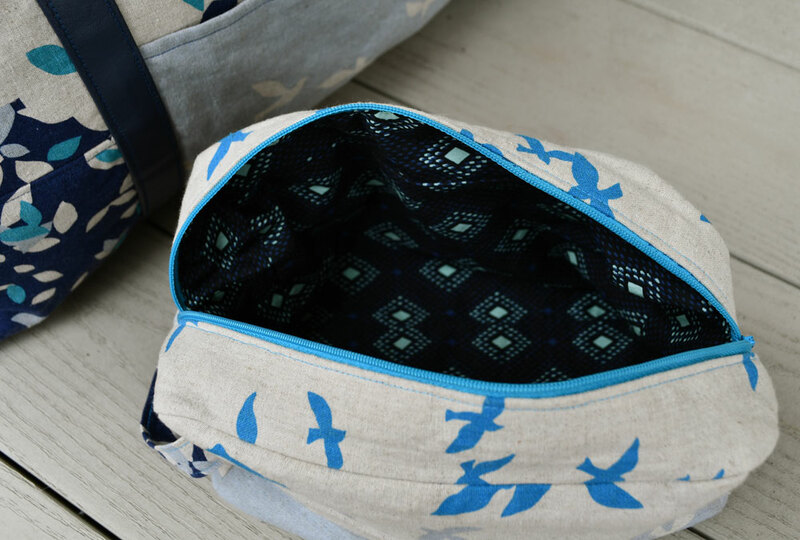 With just one layer of light weight woven interfacing, the bag doesn’t hold it shape when it is empty. I think this may be all personal preference and how you plan on using the bag. I have used it on a couple of overnight trips and once you have the bag loaded for the weekend this lack of structure doesn’t really matter. 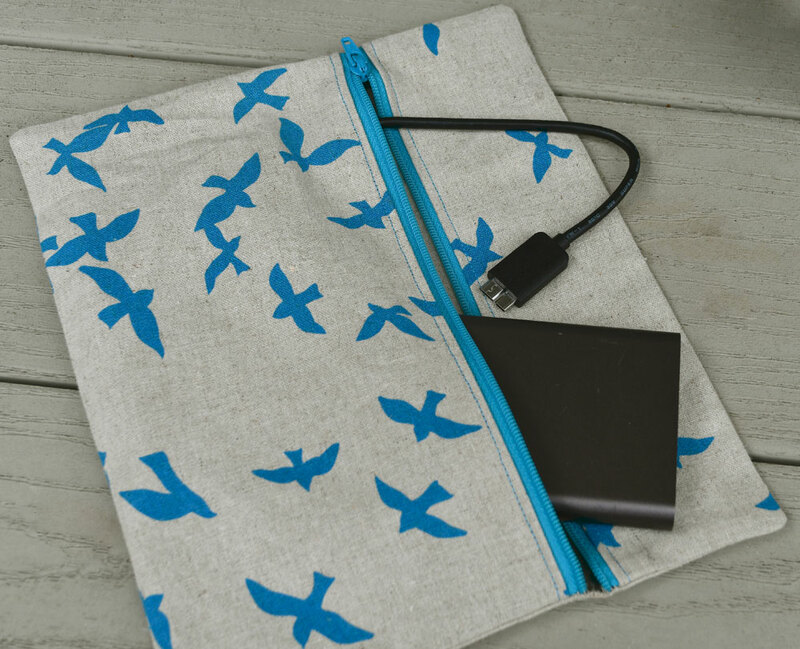 You may also want it more flexible so that it easily packs for storage or to uses as an extra bag on longer trips.